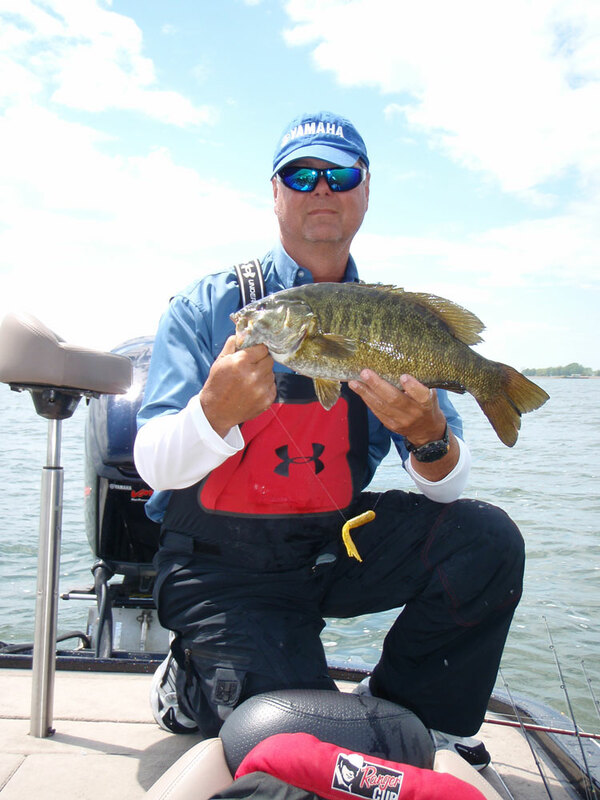 This smallmouth bass was caught from shallow water with a sand bottom and scattered, sparse vegetation. The light and mottled coloration makes this fish invisible when it is resting on the bottom. 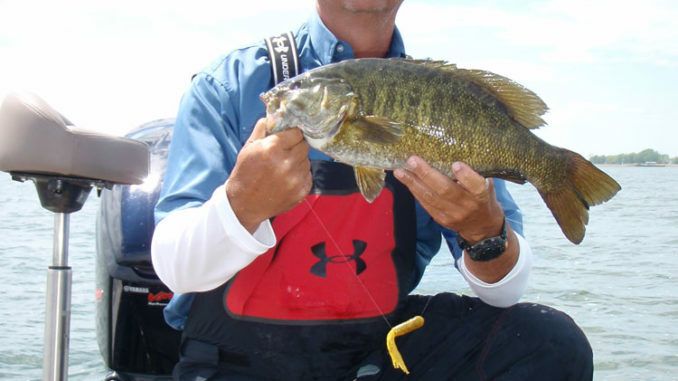 This dark smallmouth was enticed from the shadow of a boulder. 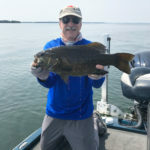 After a few minutes, they appeared — big, black smallmouth. Many were 3- to 4-pounders, but a few were noticeably larger. “Where did those come from?” I asked Steve. “Probably from between the rocks,” he replied. I’ve returned to that lake and many others like it over the years. 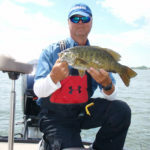 It’s common to see smallmouth bass swimming in the clear water, but they are usually light in color. I call them “cruisers,” and they often are not biters. Many, but not all, that I catch from these boulder-strewn waters are dark. I surmise that they are the bad boys hiding in the dark shadows between or under the rocks, waiting to attack an unsuspecting crayfish or minnow. 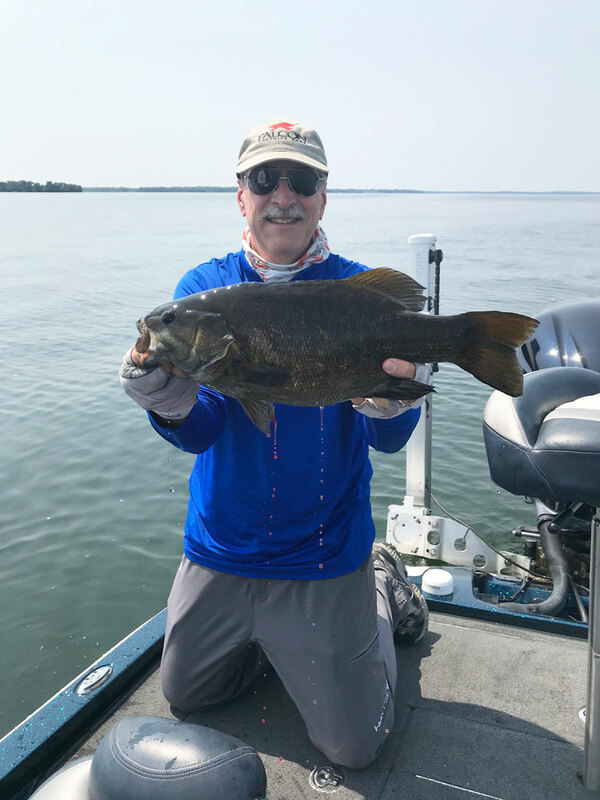 You may not have fished for smallmouth bass in clear, rocky lakes, but you have seen similar examples of the ability of fish to change color. Largemouth bass caught from clear water and vegetation have striking black and green coloration, but those from turbid water are pale with only a muted lateral color pattern. And the brightly colored bass become pale after a couple hours in a white livewell. Same for crappie and bream, but the males of these species also become more vividly colored during the spawning season. In the muddy Mississippi River, blue catfish are gray and flatheads tan to light brown. In clear water, blues have a dark, blue-grey back and white belly, and flatheads often have a mottled-brown- on-yellow topside and yellowish belly. Yes, fish have remarkable abilities to change color. 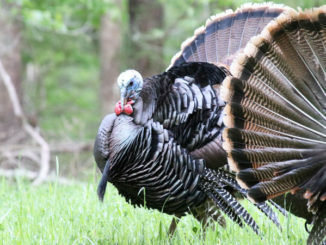 Like any predators — including waterfowl and turkey hunters — it pays to be invisible. For fish, the rules of camouflage prevail: break up the outline and look like your background. Fish in vegetation tend to have vertical barring on their flanks, breaking their outline and resembling the general background of aquatic plant stems. Fish that live in rocky areas tend to have a pattern of small, dark blotches, and those that live in barren, sand- or mud-bottom areas tend to have large blotches or simply have a uniformly dark back. Fish like striped bass and white bass that live in open water have a dark back and white belly. The fish are indistinguishable from the dark below when seen from above and from the white water surface above when looking up. Fish can change color and color patterns, but there are limits. The habitat a fish selects also has much to do with the effectiveness of the color pattern. Prey fish, whose life depends on being invisible, rely on the same principles of camouflage. Some fish announce their readiness to mate by assuming bright colors. This is true of many ornamental fish, but they are not outdone by the ubiquitous bluegill. While males are generally more colorful than females, males become more brightly colored during the spawning season. Male bluegills have a dominance hierarchy during spawning season, with the larger, dominant males often nesting in prime nesting area near the center of the colony. Whether coloration plays a role in male-to-male interactions is not known. Does brilliant coloration useful during the spawning season render bluegill more vulnerable to predation? Maybe so in a featureless farm pond, but bluegill didn’t evolve in farm ponds. If you have ever dived in a stand of native, aquatic plants, you realize that it is a kaleidoscope of moving color underwater. The color of fish is determined by relatively large, flat and dendritic cells in the skin called chromatophores. They contain black, white, yellow, blue or red pigments. When the pigment is dispersed throughout the cell, the color of the skin increases; it decreases when the pigment is retracted to the center of the chromatophore. Chromatophores are affected by nerves and hormones. Neural control results in short-term color changes, like that of the black smallmouth bass I was able to lure out from under the rock. Longer-term color changes, like the dark male crappie or the brightly multicolored male bluegill during the spawning season, are the result of hormonal signals. Fish color not only changes from light to dark or from vertical bars to no vertical bars, but some fish are able to make refined color changes to better blend with different backgrounds. What will amaze always me is how a fish that can’t see itself can so effectively modify its coloration to mimic its environment.